As a Drumsense Master Tutor I have a wide range of students from primary school children through to IT specialists and some of my students have been made the journey from beginner to Grade 8 with a few now on drum performance degree courses. My approach is the same for all of my students which is that learning the Drums should be about playing musically and supportively. From the 1st lesson I cover phrasing using simple grooves and fills but students soon apply this principle in Blues, Funk, Jazz and Latin styles developing the use of Rudiments and Reading skills as we continue the journey. I supplement lessons by accompanying on Guitar or Bass as needed as well as a variety of backing tracks – in the end its all about playing great music ! Sonor Prolite fusion kit in natural Maple with Evans EC2 heads. 2 Zildjian Custom A Crashes, New Beat Hi Hats, Bosphorous Ride & Splash, Cowbell. Full PA system for playback. Travel expenses: £5 per hour if local - £10 per hour if more than 10 minutes away. !4 years teaching experience of all ages from beginner to grade 8 and beyond. Very experienced with younger children and those with learning difficulties including Dyslexia, Dyspraxia, Austism and ADHD. Great success with the Rockschool, GCSE and Music college syllabuses. 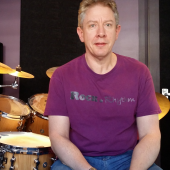 I have been playing Drums since 1980 in experimental, Dub Reggae, jazz fusion Indie and covers bands and became a registered Drumsense Master Tutor in 2012. I have taught students from as young as 4 years old to people in their 60s and many stay with me for years, some have done their Rockschool exams up to grade 8, Music GCSEs, Music Diplomas and a few are now on Music performance degree courses. Teaching music is my sole occupation, my passion and the best job I've ever had ! Further pricing details: Please go to www.rockandrhythm.org for details on discounts. Peter is a fantastic drum teacher. Peter is an excellent drummer in his own right but also has that elusive ability to teach!. I've always wanted to learn to play drums properly and in only a short time with Peter I feel like my playing has come on in great leaps. Peter's teaching process is tailored to my particular level which improves with each lesson. His step by step process combines technical drum technique learning with actual music practice which makes a massive difference. Peter takes the time to select songs suited to the particular technique being learned and then writes bespoke drum scores for play along practice. This both reinforces the technique being learned and provides great motivation to move forward to the next level.
" Lessons at Rock & Rhythm are chilled, fun in a professional environment. Peter is a really good teacher and knows how to connect with his students making a really excellent learning experience. For this reason I have chosen the harder option of travelling to his lesson rather than the easy option of finding a new teacher close by." From a Varuni whose son Isaac passed Drums with Merit grade 6 July 2013 . "My son went through a few drum tutors before we found Peter. Now, he not only looks forward to his lessons, but gets distinctions in his exams." From Anhad - a 16 year old Drummer who loves everything from Jimi Hendrix to Stevie Wonder to Odd Future.
" You wouldn't find a more welcoming , gifted, and cool teacher in England. I guarantee "
* PAY NOTHING NOW * Payments for drum lessons are made directly to Peter Bertelli. TRAVEL EXPENSES: If you choose for the Tutor to travel to the Student's location, the Student agrees to pay the Tutor's travel expenses. 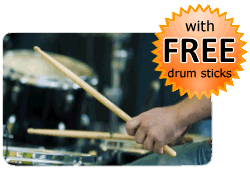 Estimated £5 per hour if local - £10 per hour if more than 10 minutes away..
You do not pay in advance to book a drum lesson with Peter Bertelli via this website. The Booking Request Form on this page enables Peter Bertelli to get in contact with you to confirm a day and time for the drum lesson.